As we continue our journey of reminiscing over memorable & influential projects from our first 55-years here at Rich & Associates, we’ve made our way into the 2000s! The 2000s are most remembered for encompassing worldwide projects from both Rich & Associates and MedPark, Inc. that paved the way in their modern design & thorough planning. 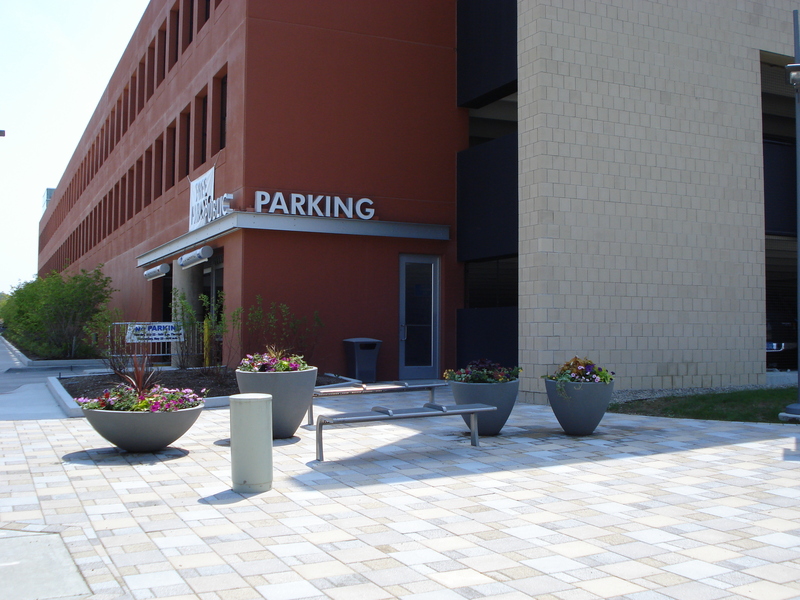 In 2005, Rich & Associates had the honor to work as parking consultants and structural engineers to Neumann Smith Architecture on a 710-space parking garage as part of the new Civic Center development for the City of Warren, MI. Not only did the Warren Civic Center project win a 2008 AIA Michigan Honor Award, it marked the first parking garage project that Rich & Associates designed as consultants to Neumann Smith. The new landmark Civic Center lines the east edge of a new city square park consisting of formal green space, a fountain/skating rink, and a pavilion building. The modern glass and brick design recalls the City’s roots as an important industrial, research, and development town, whose great icon was the GM Tech Center. The new building, which features a 7-story clock tower, creates a powerful visual “bookend” to the Vehicle Engineering Center, the tallest building on the GM Tech Center campus. The new 710-car parking structure abuts the City Hall/Library and is located so that it can also serve the neighboring police and court buildings and any future mixed-use developments. The scale and mass were designed to maximize the level of user service, to minimize the use of valuable land, and to be recessive to the City Hall/Library building and future development. Since the completion of this project, we have had the privilege of collaborating with Neumann Smith on the design of eight successful parking garage projects including the multi-award winning ‘Z’ Deck in downtown Detroit. Jesse Brown West Side Medical Center – Chicago, Il. In 1996, the US Department of Veterans Affairs issued a request for proposal for the private development of a 1,000-car parking facility (surface parking and structure). It was issued under the newly adopted Enhanced Use Lease program, where the private developer was encouraged to provide other revenue generating uses within the structure to help subsidize the cost. MEDPark, Rich & Associates’ private parking development affiliate, determined that the parking project would not be feasible without subsidies due to the DVA policy of free patient parking. Despite the lack of feasibility, MEDPark and Rich & Associates submitted a proposal response offering alternative development scenarios. MEDPark was selected over eight other submittals. Over the next four years the team and DVA met on several occasions to finalize a successful development approach that satisfied all parties. During this time, the project program grew to include a 1,600-space parking structure and 100,000 square foot office building for the Veterans Administration Regional Office. MEDPark served as the developer responsible for the design and delivery of the entire project. While Rich & Associates provided architectural and engineering services for the garage, MEDPark hired SmithGroup JJR to design the office building. Our team was responsible for the entire project providing project management services, guaranteeing the final cost and project schedule. We administered the design and construction process and negotiated the final GMP with our design/build partners Walbridge. Completed in 2005, both buildings were successfully completed on time and under budget. Today, MEDPark Management is operating both facilities. Central Market Street Mixed‐Use Development – Moscow, Russia. Rich & Associates was involved in the planning and functional design of a 450-space multi-level below grade parking structure in Moscow, Russia. As a consultant to the development team, we worked closely with their design team to produce this new structure. Our role as parking consultants involved preparing a functional design package to be used by the owner’s architect in the final design and engineering of the parking garage portion of the overall development. This functional package was essentially the detailed layout and design of the parking floor plans including grading of the floor and ramps, stall layout, traffic circulation and markings, signage, and entry and exit details. We studied numerous alternative design concepts based on the previous programming and preliminary design prepared by the architect. We also studied alternative mechanical parking structure systems versus conventional parking garage. Our mission was to develop functional plan that improved the efficiency of the traffic flow and efficiency of construction to reduce the project costs. Since our work on this project, we were retained by another Russian developer to work with them and their lead architect SOM, on the design of a 2,000-space parking garage to serve a large mixed-use hotel, office and residential development in Moscow. Brigitte Harris Cancer Pavilion Parking Garage, Henry Ford Hospital, Detroit, MI. Fast-forward 20 years to mid 2018, Rich & Associates recently completed design of a 700-space parking garage that will serve the new Brigitte Harris Cancer Pavilion at Henry Ford Hospital in Detroit. As parking consultants to lead architects SmithGroup JJR, Rich & Associates is providing parking consulting, design and engineering services. Currently under construction, the parking garage features a 2,000 sf of ground level space that will house medical data file storage, provisions for future retail space, a receiving area and ambulance bays on the ground level.